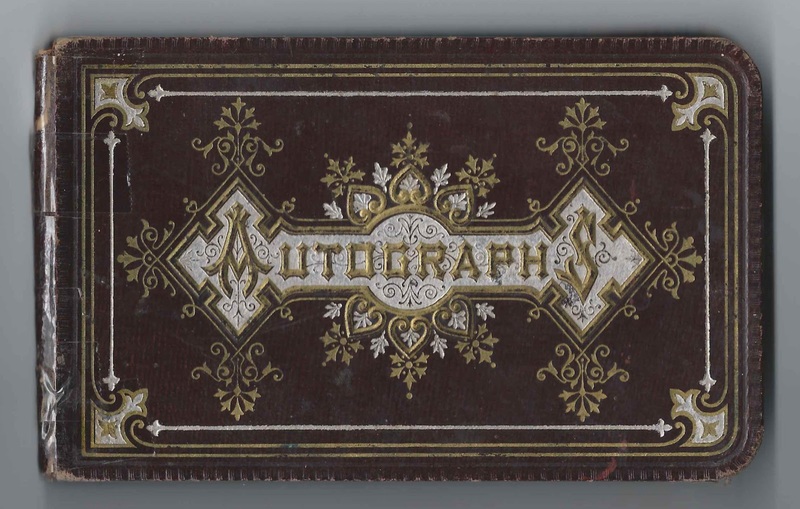 1880s autograph album of Anne Estelle Sanderson, "Annie" of Mount Vernon, Maine. 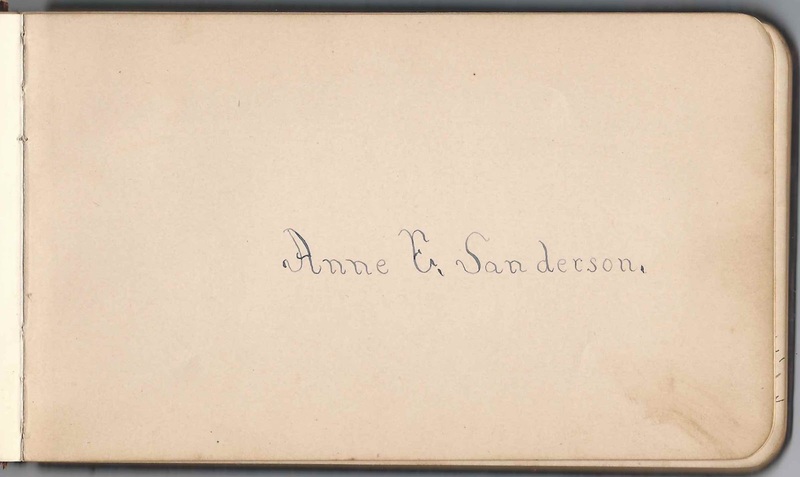 Most of the pages were signed by her classmates at Western State Normal School, now the University of Maine Farmington, at Farmington, Maine, where Annie was a member of the Second Class of 1880. Several pages were signed by administration members and faculty. Several pages are signed by people in the town of Burlington, Maine, which may have been where Annie found a teaching position in 1883. 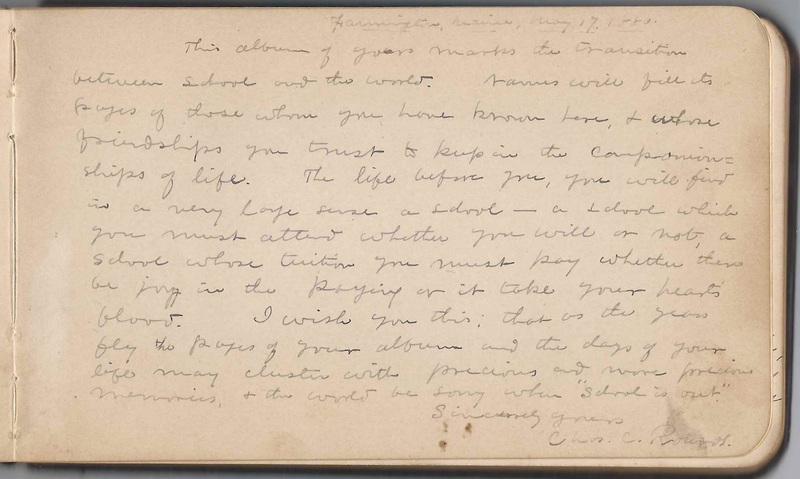 The album is approximately 7" x 4-1/4" and contains the sentiments of 48 of Annie's friends, schoolmates and instructors. An alphabetical list of the signers, with supporting information, appears at the end of this post. Much of the information comes from the History of the State Normal School, Farmington, Maine, with Sketches of the Teachers and Graduates, by George C. Purington, A.M., Fourth Principal of the School, published in 1889. Anne Estelle Sanderson was born about January 1861 at Bath, Maine, the daughter of Charles Smith Sanderson and Eliza Howard (Lovejoy) Sanderson. Both of Annie's parents died in the 1860s, her mother in 1862 and her father in 1868. By the time of the 1870 Census of Mount Vernon, Maine, Annie and her brother Edward Percy Sanderson were living with their father's sister, Harriet Newhall (Sanderson) Eaton, and Harriet's husband Sewell Eaton and two children from Sewell's previous marriage to Elizabeth Kimball Porter, who died in 1865. One of these children was Crosby Gordon Eaton. This roundabout relationship explains why Crosby called himself Annie's brother on the page he signed at Mount Vernon, Maine, on August 11, 1880. After graduating from Western State Normal School and receiving a medical degree from Bowdoin College, Dr. Eaton practiced at Oakland, Maine. He married Fannie B. Jordan of Lisbon. Sadly, his health deteriorated, and he sought relief in the climate of New Mexico, where he succumbed to consumption in 1894. On 6 October 1883 at Presque Isle, Maine, Annie E. Sanderson married Fred L. Redman, who was born at Hermon, Maine, on 9 December 1859, son of George and Mary (Carr) Redman. Fred subsequently received his medical degree and set up a practice at Corinna, Maine. Annie and Fred had, I believe, seven children, one of whom was named Crosby Gordon Redman, which would point to her high regard for Dr. Eaton, who perhaps had counseled her husband in his choice of career. Fred died in 1938, and Annie in 1944. If you have corrections and/or additions to the information above, or information on any of the signers listed below, please leave a comment or contact me directly. One of the first signers in the album was Charles Collins Rounds, who was the principal at Western State Normal School from 1868 to 1883. He was born at Waterford, Maine, in 1831. 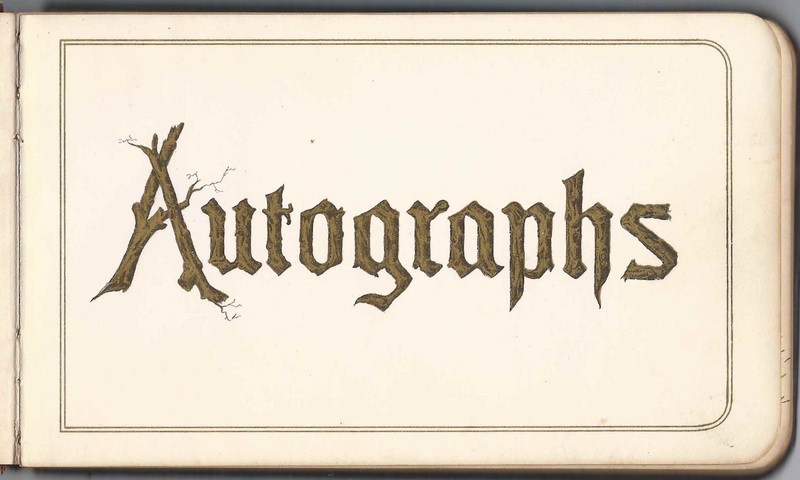 Several of his children also signed pages in the album. Clara F. Allen. She was a teacher at Western State Normal School. A Maine native, she was a graduate of Bridgewater Normal School in Massachusetts. She married J. Arthur Greene, who graduated from Western State Normal School in 1876. Allietta A. Anderson of Wells Depot, Maine, signed at Farmington, Maine, on June 9, 1880. After graduation from Western State Normal School, she taught at Lincoln, Rhode Island, and then at Wells and Kittery, Maine. Became a dressmaker at Boston, then a bank teller at Charlestown, Massachusetts. Lillian E. Bass of East Wilton, Maine, signed on May 27, 1880. After graduation from Western State Normal School, she taught Carthage, Wilton, Wells and Lisbon Falls, Maine. Married on December 24, 1880 Wilder B. Neal. They moved to Rochester, New Hampshire, where Wilder was a merchant; three children. Jennie Boynton of Cornish, Maine, signed at Farmington, Maine, on June 22, 1880; "F.W.M.O." After graduation from Western State Normal School, she taught at Westport, at Cornish, Maine, and at Farmington, Connecticut. On July 28, 1886, she married C. E. Brandt of Farmington, Connecticut. He died October 13, 1888. Lived at Minneapolis, Minnesota. Ida G. Bradbury of Burlington, Maine, signed on December 24, 1882. Georgia Bucknam of Yarmouth, Maine, signed on April 23, 1880. A native of Newton Centre, Massachusetts, she was a teacher at Western State Normal School in 1879 and 1880. She had graduated from the school in the Second Class of 1874. Helen M. Cobb, signed at Yarmouth, Maine, on August 1, 1883. After graduation from Western State Normal School, she had charge of the high school at Plymouth, New Hampshire; later was assistant in the high school at Claremont, New Hampshire; and principal at Hanover, New Hampshire. Later was assistant at Brewster Free Academy at Wolfeboro, New Hampshire. C. M. Coffin of Burlington, Maine, signed on March 11, 1883. Presumably Charles M. Coffin, who wife Caroline (Cookson) Coffin signed the right facing page. Mrs. C. M. Coffin, signed at Burlington, Maine, on March 11, 1883. Presumably Caroline (Cookson) Coffin, whose husband Charles M. Coffin signed the left facing page. T. Parker Craig of Island Falls, Maine, signed at Western State Normal School on June 2, 1880; "your friend and classmate". Thomas Parker Craig taught for a while and then went into the mining industry in Colorado; became United States Deputy Mineral Surveyor, at Aspen, Colorado. 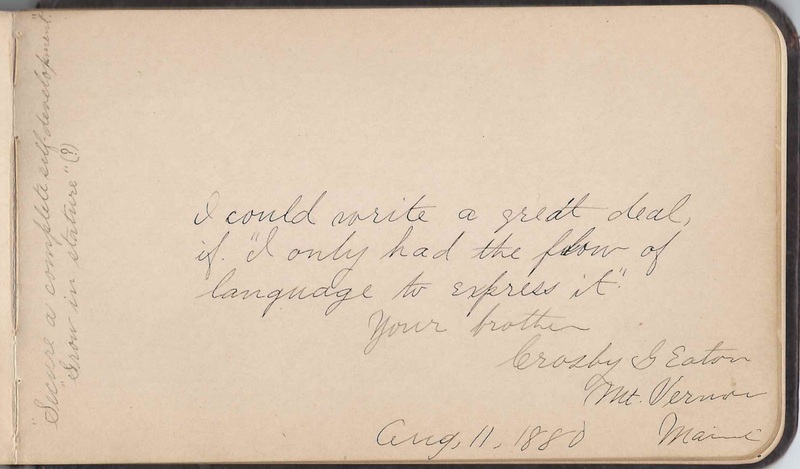 Crosby G. Eaton of Mount Vernon, Maine, signed on August 11, 1880; "your brother". Dr. Crosby G. Eaton and album owner Annie weren't brother and sister but grew up in the same household. Crosby's widowed father, Sewell Eaton, married album owner Annie Sanderson's paternal aunt Harriet Newhall Sanderson. Annie's parents had both died in the 1860s. Seretha E. Farrar of North Turner, Maine, signed on June 25, 1880; "F.W.M.O." After graduation from Western State Normal School, she taught at Turner, Maine, and Auburn, Maine. In 1884, she married B. Frank Page, a footware merchant at Brooklyn, New York. Was living at Somerville, Massachusetts; one child. Emma L. Hacker of Saccarappa, Maine, signed at Farmington, Maine, on July 8, 1883. After graduation from Western State Normal School, she taught at Saccarappa Grammar School and then was a student at the Friends School at Providence, Rhode Island, and at Bryn Mawr College. W. Harper, signed at Farmington, Maine, on April 13, 1880. Presumably William Harper of Dalton, Georgia, who taught at Western State Normal School from 1877-1881. After his graduation from a western college, he studied at a German university and, while there, married Bertha Tauber, daughter of a German artist; they had six children. He was an educator, an administrator and a cartographer/geographer. Jennie M. Hayden, signed at Farmington, Maine, on April 21, 1880. A teacher at Western State Normal School from 1872-1811. She was from Raymond, Maine and taught at Maine and Minnesota; studied at Boston Normal Art School, Bates College, Gorham Seminary, Harvard Summer School, Martha's Vineyard Summer Institute. She married Dr. John Irving Sturgis of New Gloucester, Maine, on September 5, 1883. E. Burt Holt, signed at Western State Normal School on June 29, 1880. Before this school, Emily Burt Holt had attended a year at the Cook County Normal School at Englewood, Illinois. After graduation, she taught at the Model School. On July 2, 1881, she married Daniel B. Berry of New Sharon; two children. Clara E. House of North Turner, Maine; "W.F.M.O. ", signed at Farmington, Maine, on June 17, 1880. After graduation from Western State Normal School, she taught in Maine, at Houtzdale, Pennsylvania, and at Minneapolis, Minnesota. Julia B. House of North Turner, Maine, signed at Farmington, Maine, on June 17, 1880; "Second Class of 1880"; "F.W.M.O." After graduation from Western State Normal School, she taught in Maine; at Houtzdale, Pennsylvania; and at Minneapolis, Minnesota. C. Maria Hunt of Farmington, Maine, signed at Western State Normal School on June 7, 1880. After graduation, she taught at Temple, Avon and Farmington; married on June 20, 1883, Everett C. Dow of Livermore Falls, Maine, also a graduate of W.S.N.S. ; three children. May V. Jacobs of Farmington, Maine; "Classmate of '80", presumably at Western State Normal School. Mary V. Jacobs of Farmington, Maine, who taught at New Sharon and Eustis, Maine; Athol, Massachusetts; Farmington, Maine. An accomplished artist, she married Elmer E. Jennings of Farmington, Maine. H. J. Keith, "Little Blue", signed on May 21, 1880. Presumably Herbert J. Keith of Gardiner, Maine, graduated from Western State Normal School and taught at Farmington, Maine, and in Minnesota; went into the produce business. A. A. Macomber of East Wilton, Maine, signed at Western State Normal School in June 1880. She was Abbie A. Macomber, who, after graduation, taught at New Sharon, Vinalhaven, Farmington, Phillips and Wilton. N. M. Marshall of Gorham, Maine, signed on January 14, 1881. He was Dr. Nathaniel Mason Marshall, husband of Eva E. (Blake) Marshall, who signed the right facing page. Eva E. Marshall of Gorham, Maine, signed on January 14, 1881; she was Eva E. (Blake) Marshall, wife of Dr. Nathaniel Mason Marshall, who signed the left facing page. Jillie H. Mayhew of Mount Vernon, Maine, signed at Western State Normal School on June 7, 1880. After graduation, she taught at Vinalhaven, Mount Vernon and New Gloucester. Mary E. Norton of Farmington, Maine; "your loving classmate". After graduation from Western State Normal School, she taught at New Sharon, Maine, and Farmington, Maine; and at Troy, Ohio; completed the Chautauqua Course. Married Dr. Lauren M. Lindenberger of Troy, Ohio; one child. Mabel L. Pierce, signed at Burlington, Maine, on March 2, 1883. She was Mabel Laura (Gonyer) Pierce, whose husband Jason Lee Pierce signed the right facing page. J. L. Pierce, signed at Burlington, Maine, on February 25, 1883. He was Jason Lee Pierce, whose wife Mabel Laura (Gonyer) Pierce signed the left facing page. R. Mae Porter of West New Portland, Maine; "F.W.M.O." After graduation from Western State Normal School, she taught at New Portland, Maine, and then learned the dressmaking trade, which she practiced at Lawrence, Massachusetts. Married January 1, 1884, to Orren W. Simmonds, a merchant at West New Portland, Maine, who later studied medicine. A. C. Rounds of Farmington, Maine, signed at Western State Normal School, Second Class of 1880. He taught school at Turner, Maine; Jay, Maine; and was a student and taught at Hallowell Classical and Scientific Academy; graduated from Amherst College; Harvard Law School. Ralph W. Rounds of Farmington, Maine, signed at Western State Normal School on May 18, 1880. There was a Ralph S. Rounds of Farmington listed in the history of Western State Normal School, son of signer Charles C. Rounds and brother of signer Arthur C. Rounds. After graduation he went to Hallowell Classical and Scientific Academy; taught a bit; graduated from Amherst College in 1887. Taught at Adelphi Academy in Brooklyn, New York and at Cooper Union. Anne E. Sanderson, album owner. Originally from Mount Vernon, Maine, she graduated from Western State Normal School and taught for two years and then married Frank L. Redman. They moved to Corinna, Maine, where Fred was a physician; three children. Mary E. Whittier of South Windham, Maine, signed at Farmington, Maine, on June 13, 1880. After graduation from Western State Normal School, she taught at Windham and Deering, Maine; then became principal of an intermediate and grammar school at Deering. R. Woodbury, signed at Castine, Maine, on July 7, 1880. Presumably Roliston Woodbury (1840-1888), then principal of Castine State Normal School. Born at Sweden, Maine; began teaching in his late teens; left Bowdoin College to serve in the Civil War; returned from the War to attend Western State Normal School, from which he graduated in 1867; became a faculty member there until 1879 when he left to become principal at Castine State Normal School.